Are you wondering what works with Facebook and what’s a waste of time? There’s recently been ton of research to understand how Facebook marketing is helping (or hurting) businesses. Here are five noteworthy Facebook findings we uncovered from the latest published research. Facebook is at the center of a sizable shift to mobile. In the U.S. alone, 78% of all Facebook users (just shy of 100 million people) logged into their Facebook accounts via mobile this year (TechCrunch). Research from eMarketer predicts that this number will continue to grow and by 2017, 154.7 million Americans will be using Facebook on their mobile devices. The future of Facebook is in mobile. Take a look at your Facebook page on your mobile device to see what others are seeing (Public view, not Admin view). Since the mobile experience doesn’t show your complete timeline, highlight your best content with a pinned post. Photos are the best-performing post types on Facebook, so be sure to add colorful, interesting images to all your posts, offers and ads. If you have a local business, encourage customers to check in on Facebook at your location (more on that later!). Mobile searchers tend to make local buying decisions (e.g., where to eat, where to shop, etc.). Recommendations and check-ins from mobile users’ friends appear first on their mobile devices, making it a fantastic tool for word-of-mouth marketing. According to the 2013 Social Rich Media Benchmark Report (ShopIgniter), promoting your Facebook posts with a paid ad increases organic and viral reach significantly but reduces click-throughs. This is true for all post types (video, offers, photos, links and questions) except status updates. In the case of status updates, unpaid posts have a much higher reach than paid posts. 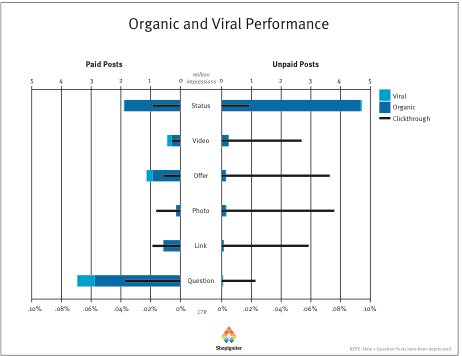 Promoting Facebook posts with paid ads increases reach but reduces CTR. Paid ads make a big difference on Facebook—at least in terms of reach and impressions. But before you start investing in Facebook ads, think about your target audience, focus on your marketing goals and understand how different post types perform when they’re promoted with ads. Paid ads are used for promotional content, which by default draws less engagement than non-promotional content. If you’re more interested in driving brand awareness or increasing your customer base, then by all means use paid ads because of their viral nature. But if you’re trying to build your email list (you’ll need folks to click through to a landing page), then paying to promote the post might be a waste of cash, according to the research. And don’t forget, whenever you want people to click, give them lots of images! Facebook doesn’t have a Dislike button. However, users can show their aversion toward your content by hiding it from their news feed. More research from ShopIgniter shows that negative feedback—which includes the following actions by users: Hide Post, Hide All Posts, Report as Spam, Unlike Page—increases (hurts conversion) the more you add paid media to your posts. Negative feedback increases as paid ads are applied to most post types. 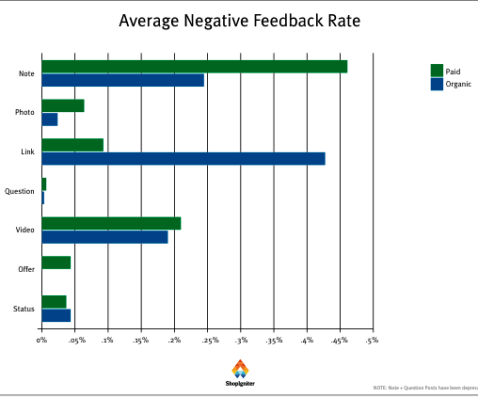 The chart shows the negative feedback rate for paid and organic Facebook posts. Longer bars are bad as they indicate higher negative feedback. For most post types except links, negative feedback increases when paid ads are used. As far as paid posts go, notes are most disliked (hardly anyone uses them anyway), followed by video. Although photos are popular on Facebook, not all photos are created equal. As a marketer, you should know exactly what your audience’s preferences are by posting photos they will enjoy, like and share. If you’re not sure, do some A/B split tests with various images to find out. The ‘Question’ is king—You can’t go wrong with asking questions on Facebook. At best you’ll get lots of responses, and at the very worst you’ll get little or no negative feedback. Surprisingly, Facebook Offers generate less negative feedback than links! That’s because everyone likes a good deal, even if it ‘interrupts’ your news feed through an ad. The best thing to do is mix up your posts. Try both paid and unpaid versions of the same post type. At the end of the day, only your Page Insights can tell you what will work for you and what will not. According to EdgeRank Checker, Facebook hashtags have done nothing to help with additional exposure for your brand. In fact the opposite is true. The research indicates that posts with hashtags are not only less likely to go viral, but also make people less likely to engage with the content. 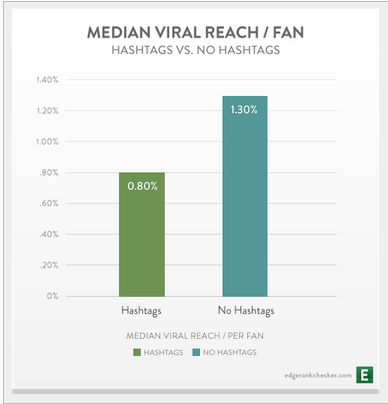 Facebook hashtags could actually be hurting, not helping, your brand. Second is perception. Before the official launch of hashtags in June of this year, people or brands who used hashtags on Facebook were perceived to be clueless. Other users figured they didn’t understand how to use Facebook. There have also been complaints that status updates with hashtags are nothing more than automated posts created by lazy marketers on Twitter. So based on the research, if you want your fans and their friends to share your Facebook posts, you may want to avoid using hashtags or at least do a lot of your own testing to see if they’re helping or hurting your brand. #5: And the Highest CTR Goes to… Sponsored Check-in Stories! Sponsored check-in stories, where users are shown an ad in their news feed for a place they previously checked in, received by far the highest click-through rate (CTR) among all ad types and sponsored stories. The Facebook Ads Benchmark Report (Salesforce) shows that at 3.2%, this CTR is even higher than sponsored like stories, which are very popular with marketers. 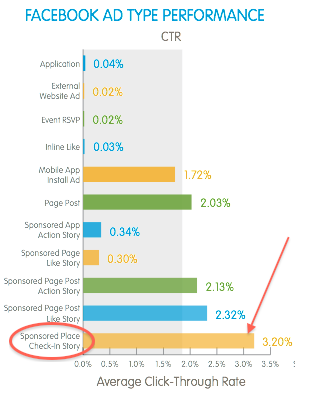 Average CTR of sponsored check-in stories trumps all other ad types. Sponsored check-in stories are used to reach your fans’ friends on their news feed. High CTRs could be indicative of peer influence. When a Facebook user sees (on her news feed) that her friend has checked into a particular store, she’ll be curious to learn more about that location and will probably click through for more information. As the owner of that business, you want to encourage more people to take the same action, so you’ll pay to highlight the original action of checking in. So if you’re thinking about building a local fan base, engaging and rewarding customers, or reaching your customers’ friends, why not design a campaign around the check-in stories that your customers are generating? Fair warning—sponsored check-in stories are very expensive (in terms of cost per impression or CPM), but the investment could be worth it if more customers come to your store and buy your products. It’s something to think about! What do you think? Which of these trends or insights do you agree or disagree with? Please share your thoughts in the comment box below.